There are few places in the world that can legitimately claim something this bold, and you won’t have to travel as far off the beaten path as you think. North and West Vancouver, also known as the ‘North Shore,’ provide the picture-perfect backdrop for Vancouver, British Columbia — host city for the 2010 Winter Olympics. Mountains, valleys, rivers, ocean inlets, cityscape views… sightseeing and activities abound in this naturally beautiful community. To start, there are three ski hills (that’s right… three! ), all with amazing views overlooking the city. Depending on the snowfall, the season runs from early December to late April.Cypress Mountain, the Freestyle Skiing and Snowboard venue for the 2010 Winter Olympics, offers some great downhill and cross-country terrain. Seymour Mountain offers downhill, snowshoeing and a tubing/toboggan park. Last but certainly not least is Grouse Mountain, perhaps the best-known of them all. Grouse is a four season resort that offers winter activities such as downhill, snowshoeing and skating, and summer adrenaline adventures like zip lining, paragliding and helicopter tours. Throughout the year, their Wildlife Refuge provides a natural sanctuary for orphaned grizzly bears and gray wolves. Vancouver is definitely a water-logged city and the North Shore is no exception. If you fancy trying some canoeing or kayaking, there are some wonderful locations to inspire and challenge any skill level. 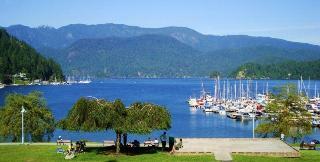 The most popular is Deep Cove, along the quiet shores of Indian Arm. It is a paddler’s paradise any time of the year due to its sheltered, calm waters. This hidden treasure of a village, on the furthest east side of North Vancouver, is worth a stop just for the scenery. Of course there is always the option of the open waters of the Burrard Inlet in West Vancouver or the Capilano and Seymour rivers, for the more experienced paddlers. You’ll love the diversity of the North Shore. No matter your activity or reason for visiting, its rugged and natural beauty will rejuvenate your spirit. Discover Vancouver’s best kept secret for yourself. From downtown Vancouver, a short drive across the Lions Gate Bridge or the Ironworkers Memorial Bridge will land you in North and West Vancouver. If you prefer public transport, a scenic 15-minute water-taxi on the Seabus will take you across the Burrard Inlet, whisking you away from the city’s busy downtown core to North Vancouver’s Quay. If you wish to purchase ths article for your publication, you can contact the author directly here.